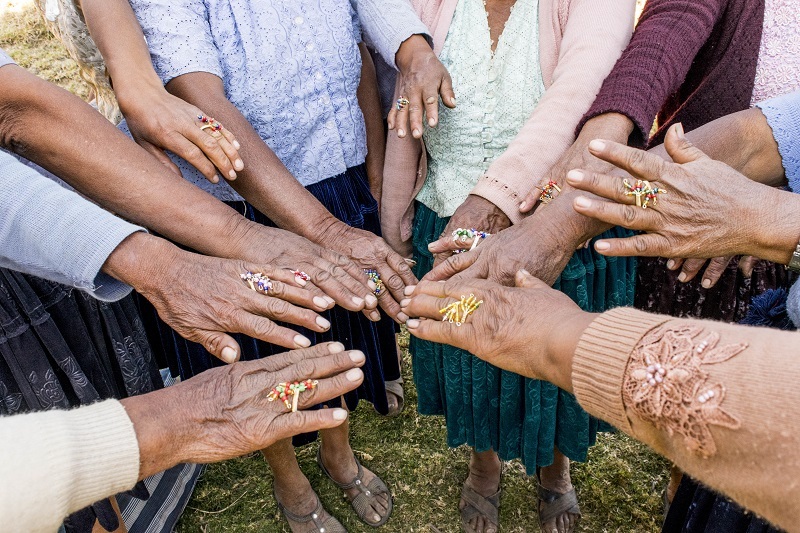 The Huancarani weavers grew up using brightly colored synthetic yarn for weaving and knitting festive wear and cheap easy to use powdered synthetic dyes for dyeing their local wool for colorful blankets. 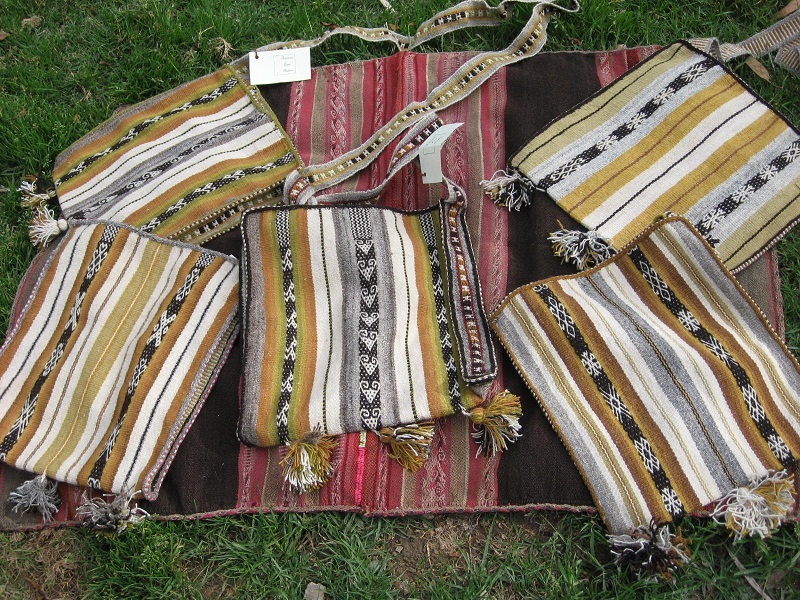 Undyed wool was frequently used for functional products such as woven gunny sacks and ponchos with the variety of natural colors allowing for contrasting stripes and designs. 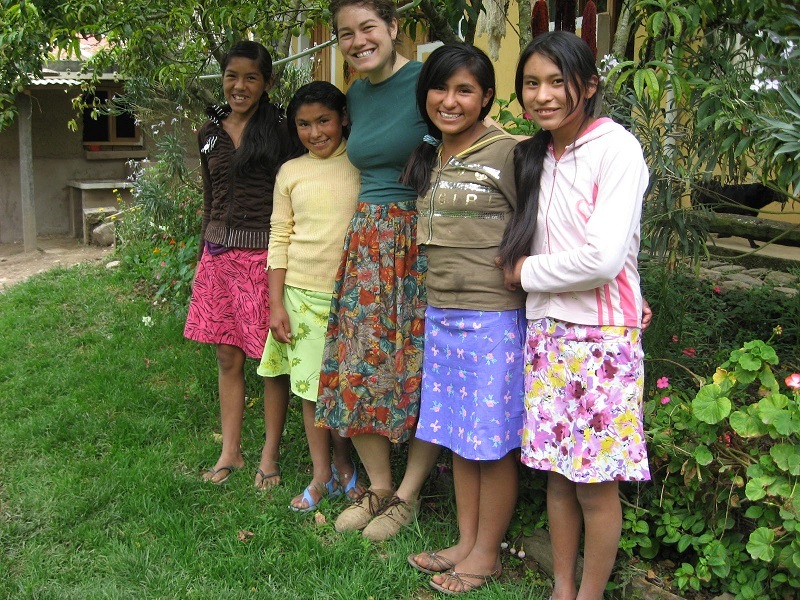 In 2007, the knowledge of natural dye techniques were fading but not lost when they asked Dorinda, a Peace Corps volunteer, if she could help them to rescue their natural dye techniques. 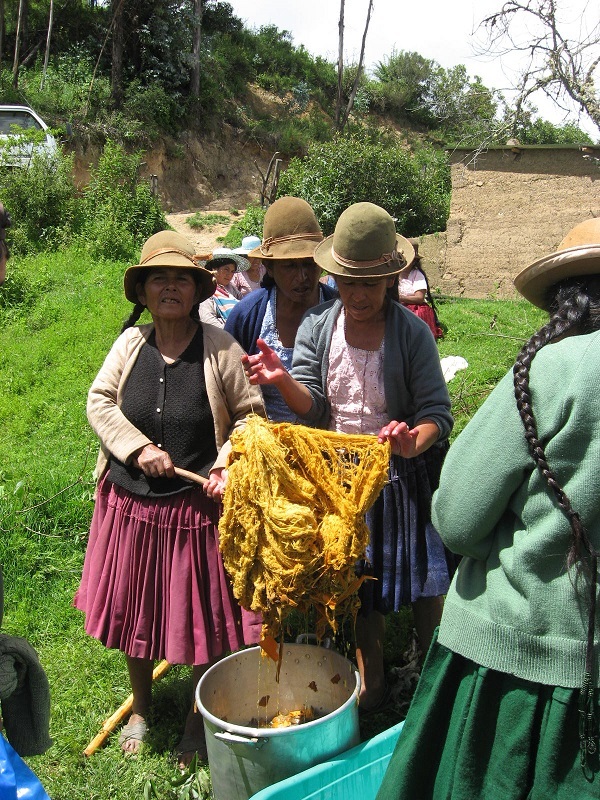 The first natural dye workshop in Huancarani took place in mid-March of 2008 and was a collaboration between the municipal government who supplied the transportation and a Peace Corps Partnership Program (PCPP) grant that paid the wages for a local woman who was hired as the local natural dye trainer and Doña Máxima who was contracted as the workshop coordinator and translator. 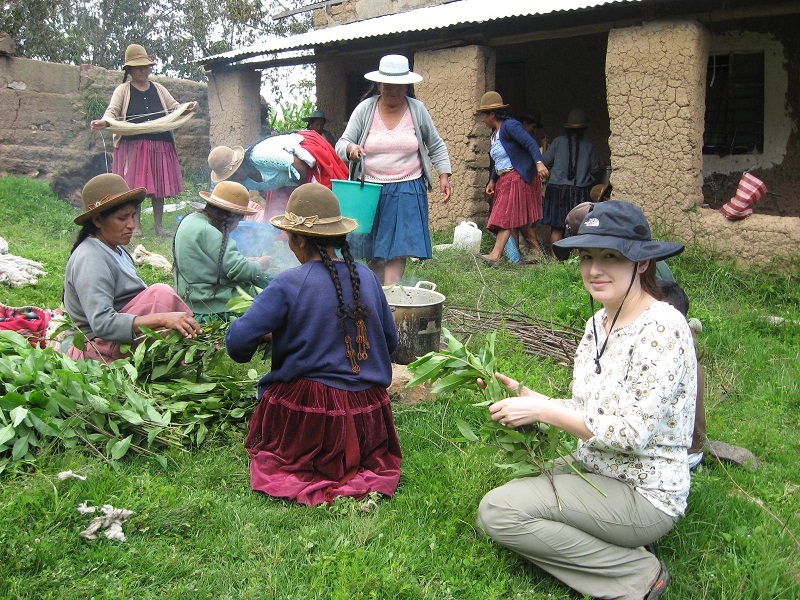 The trainer had walked high into the mountains to harvest the macha macha berries for the workshop. 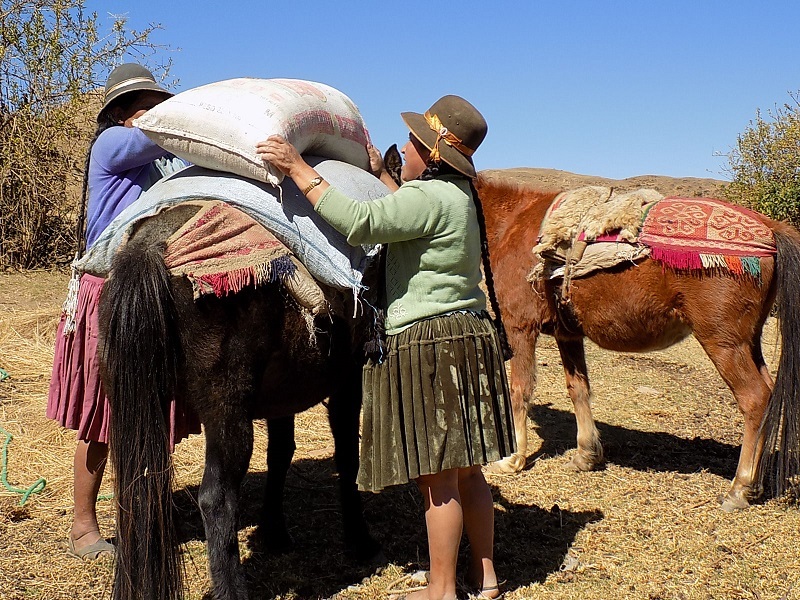 Upon arrival in Huancarani the women took off to harvest suyku which was in full bloom. The leaves and flowers were stripped into a second borrowed dye pot. 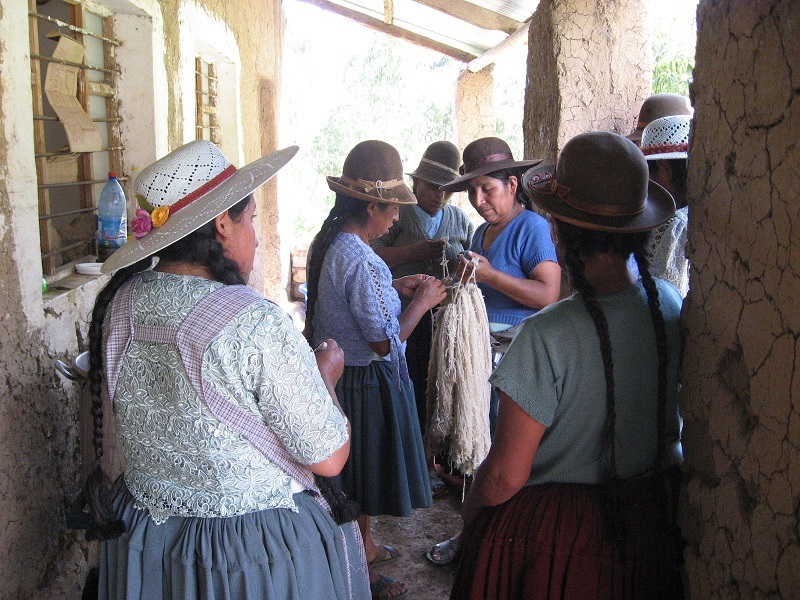 The trainer´s knowledge stemmed from a workshop a non-government agency had provided not from natural dye techniques handed down through generations. She had no knowledge of mordants and added a handful of salt, half a dozen halved limes, and a cup of vinegar to every dye pot. Today, suyku is the favorite local dye plant because of the range of hues the weavers have learned how to achieve through Ph manipulation. 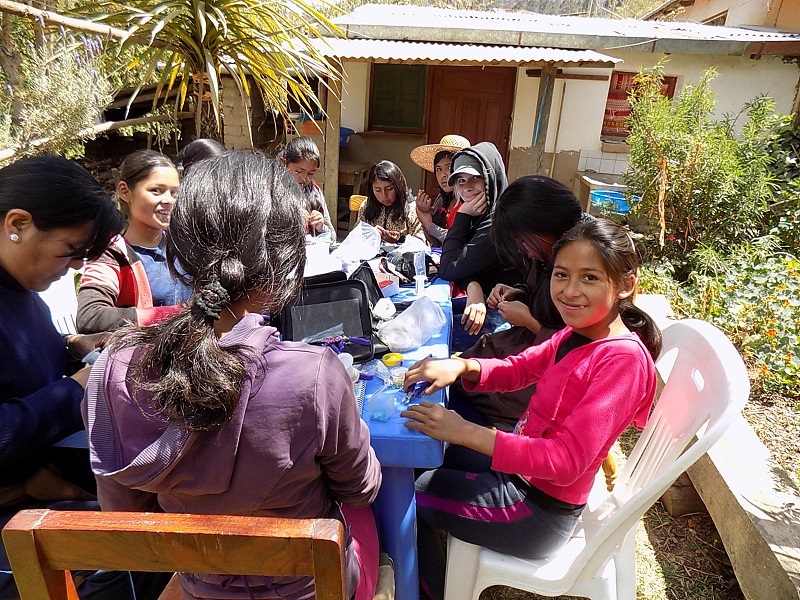 The second dye workshop in Huancarani was the focus of the PCPP grant that paid for the Arte Andino Board of Directors who were all rural weavers to visit Independencia for 3 days of workshops. 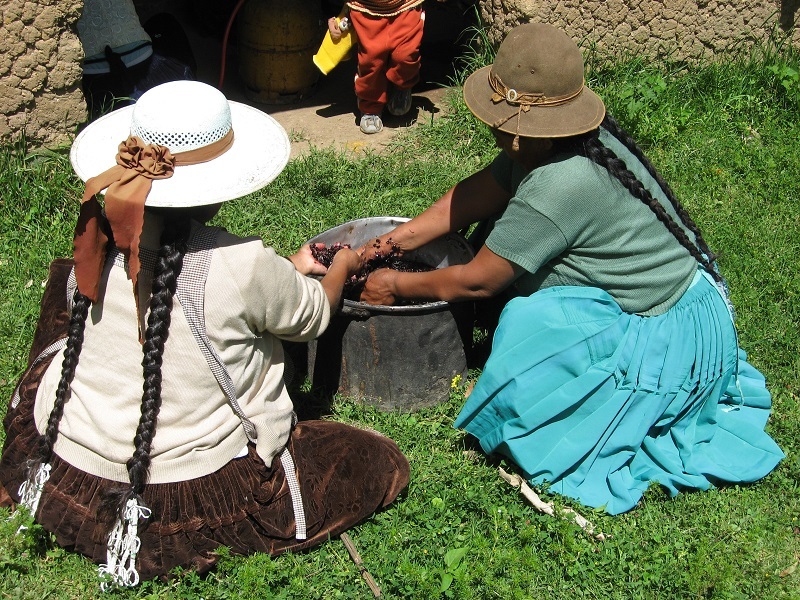 They brought cochineal for dyeing and alum, iron sulfate, and copper sulfate to teach the mordant process. 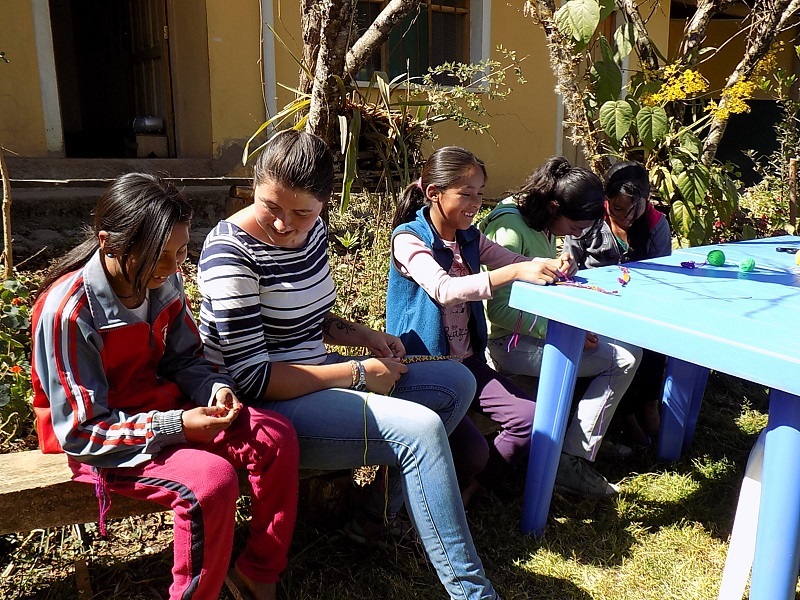 The Huancarani weavers were intrigued with cochineal having participated in a cochineal workshop, but there had been no follow-up to the 1 day of training and they had no knowledge as to the cultivation of cochineal. 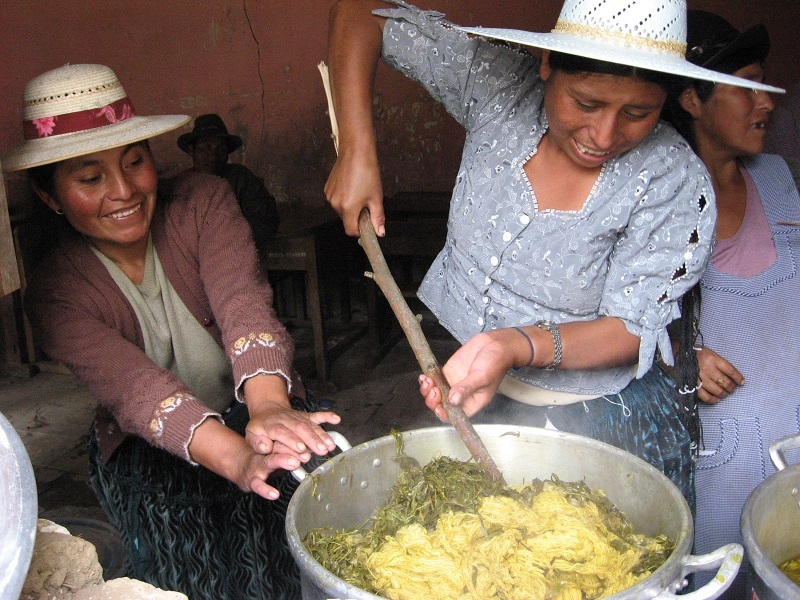 It grows in Bolivia on the nopal cactus that resides at lower drier elevations. 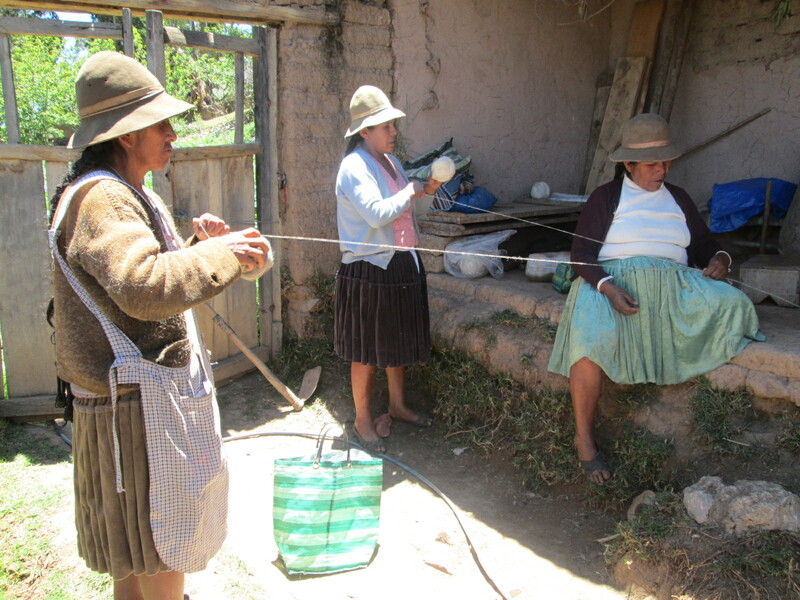 The mordants used regularly today are alum and millu a local mineral salt. Copper sulfate is used occasionally with plants and citric acid with cochineal for orange tones. Salt and chicha vinegar are also used on occasion. 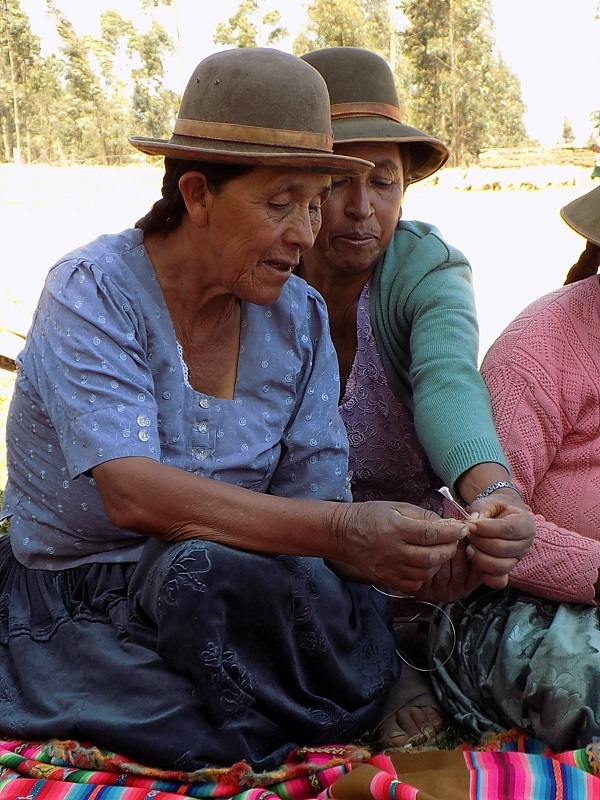 Everyone´s interest in local natural dyes was piqued but Dorinda´s Peace Corps service ended abruptly and a few months later the Peace Corps left Bolivia. 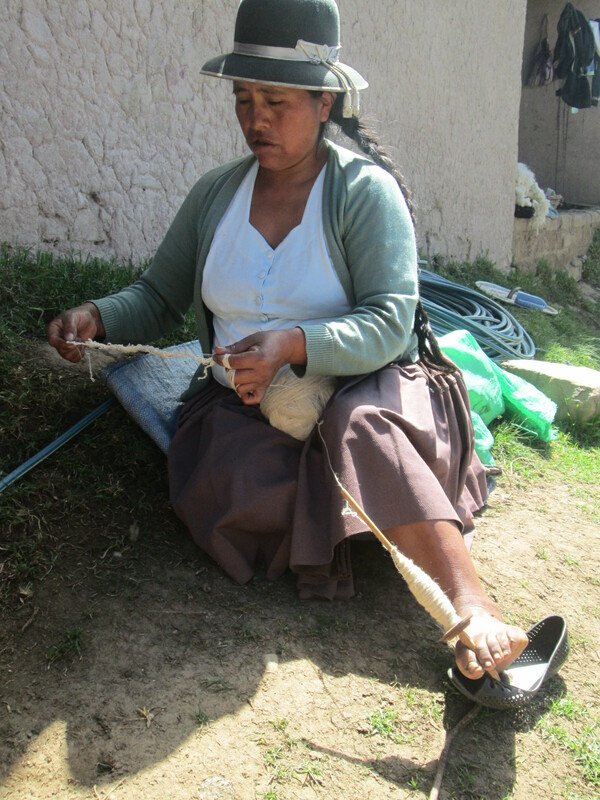 Three months later she returned on her own to carry on the natural dye workshops, and continued to call her volunteer efforts PAZA. 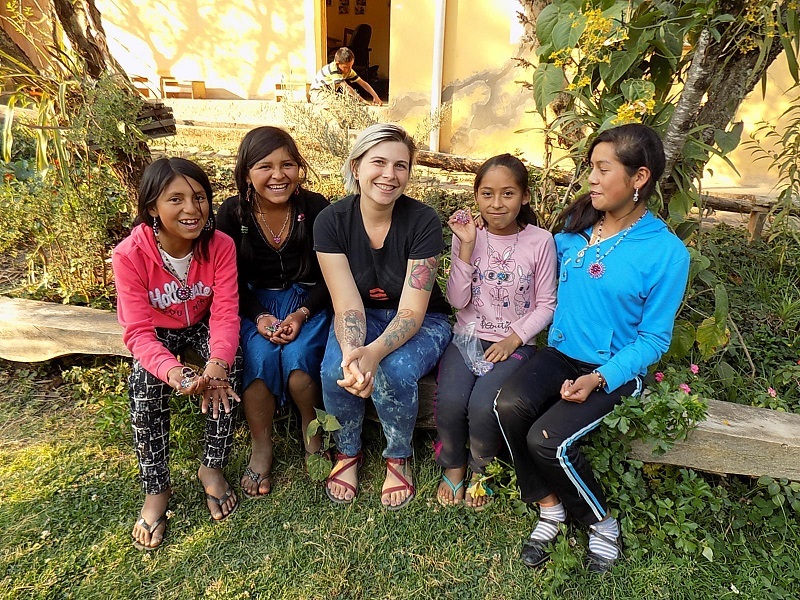 Although Peace Corps had left a non-profit organization called KURMI had begun working in Independencia funded by a development contract for the empowerment of women. 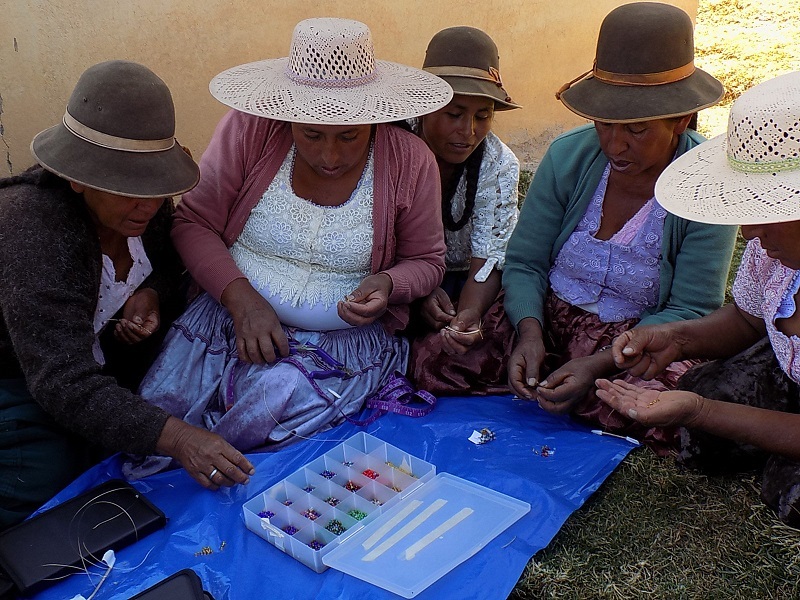 The local government continued to provide transportation to rural communities so that Dorinda, the local trainer and Doña Máxima could offer dye workshops in 5 rural communities. 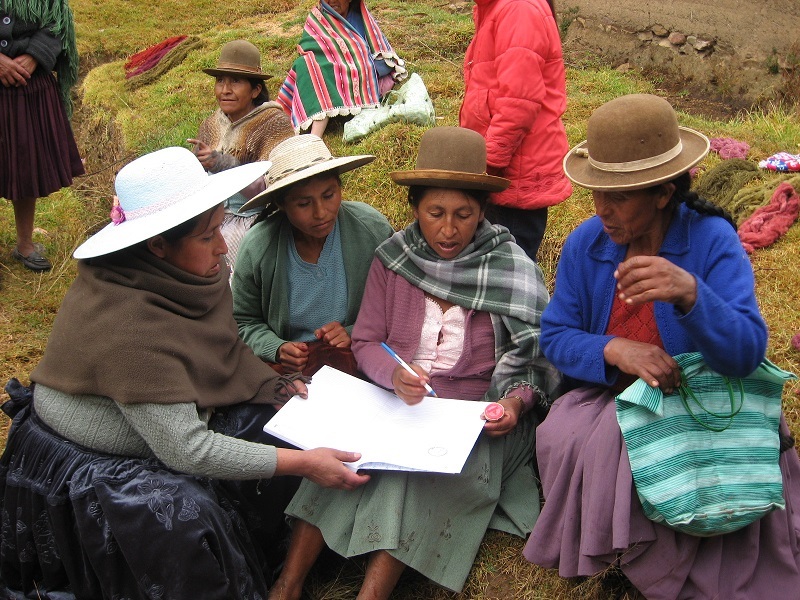 KURMI staff would occasionally participate in a workshop to present topics on women´s rights. 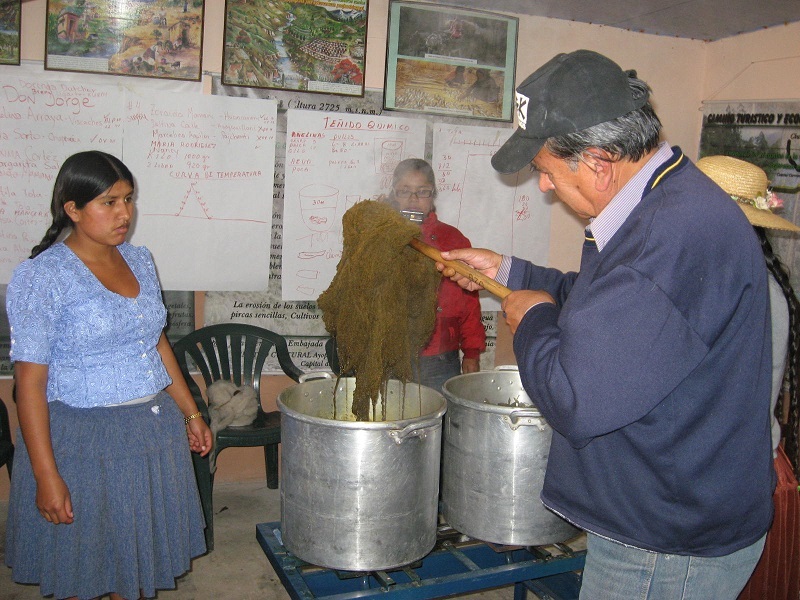 The mordant processes learned from Arte Andino were well practiced and in July of 2009 thanks to the collaboration of the municipal government, KURMI, and PAZA an extraordinary 3 day intensive natural dye workshop was held in Independencia to train local trainers. 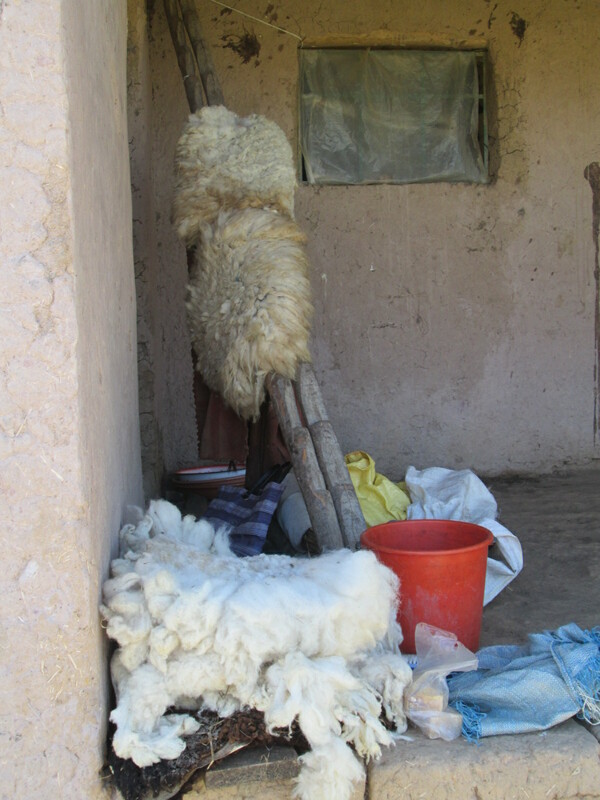 KURMI brought weavers from other highland communities with whom they worked. 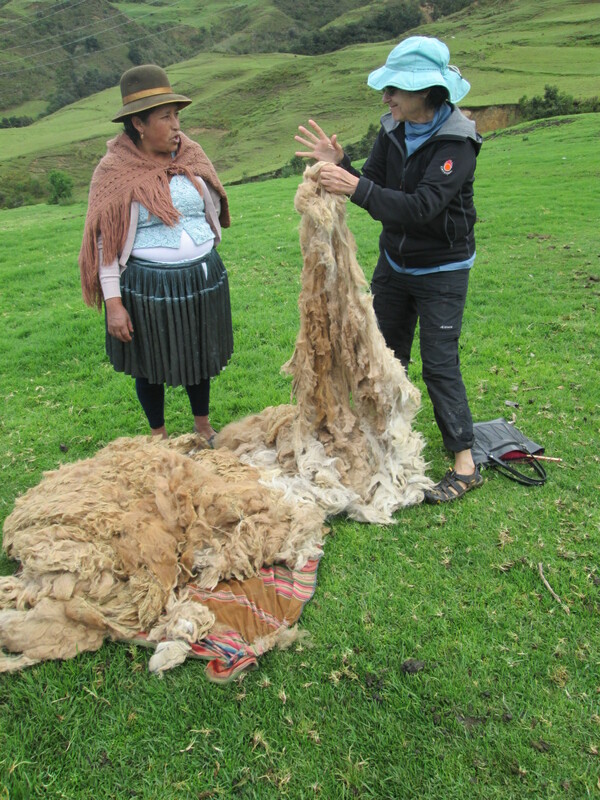 The trainer, Don Jorge Gandarillas, had been the Arte Andino natural dye trainer and had over 50 years of experience working with Andean textile revival projects. 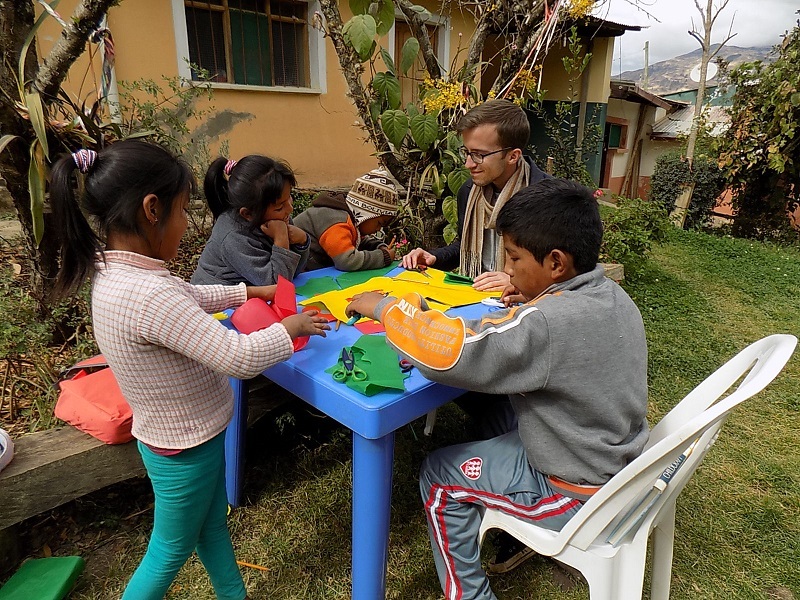 He was a tough taskmaster and at the end of the course he assigned the participants the task of teaching a dye class in their community and returning in October to share their experience with the group. 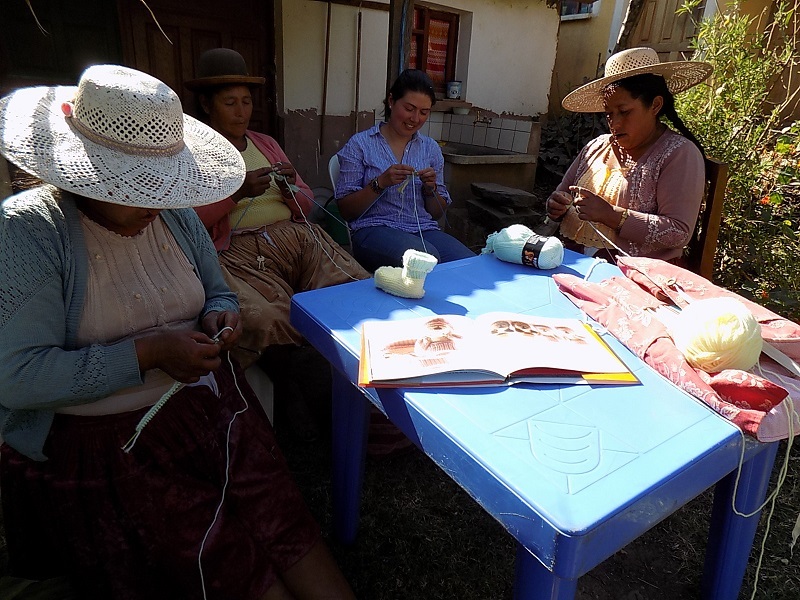 The group met again in October without the support of the municipal government, and sadly it was the last collaboration in support of the Andean weaving tradition in the municipality. 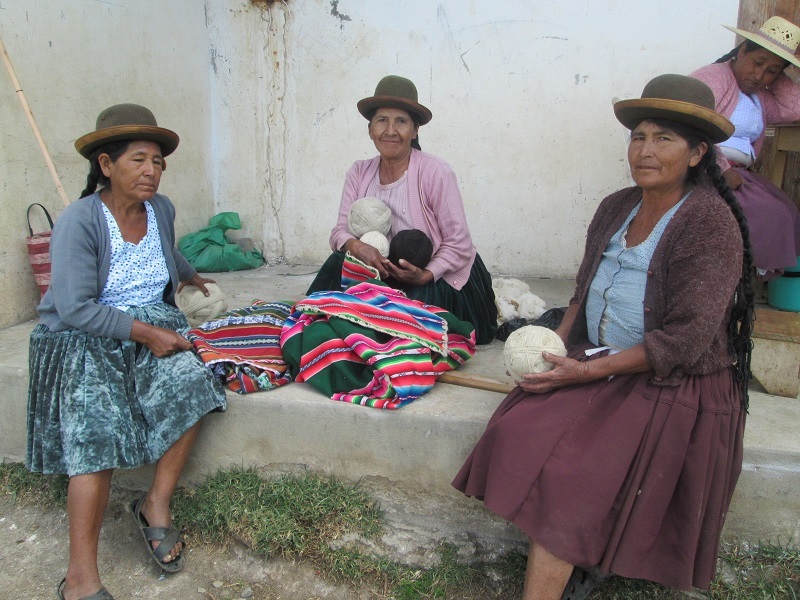 Friendships had formed between the weavers from out of town and the local weavers. 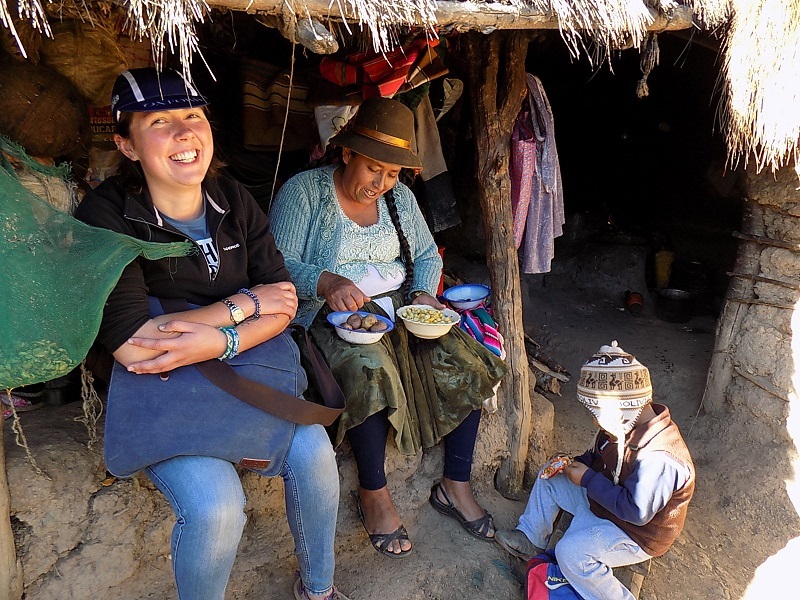 Upon meeting again, they exchanged information about their successful and unsuccessful experiments with the plethora of Andean dye plants. 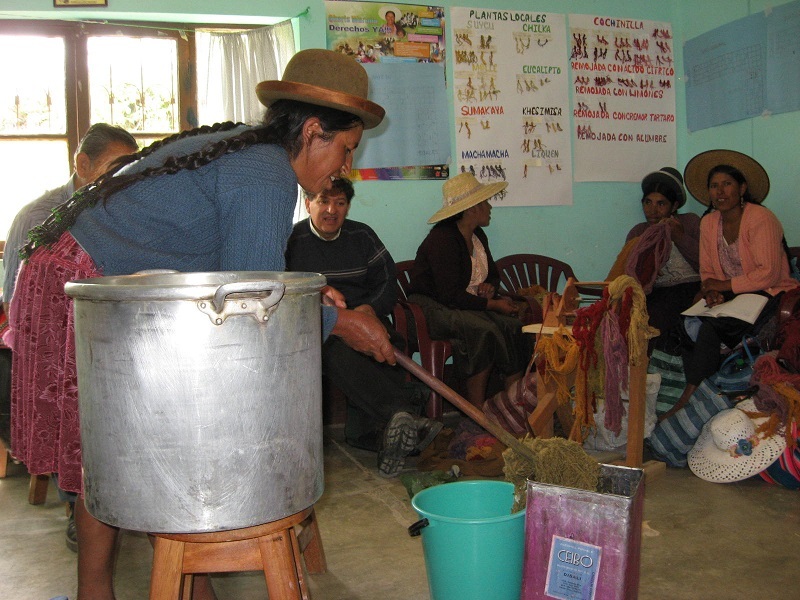 Each participant had to role play as a natural dye trainer in front of the class. 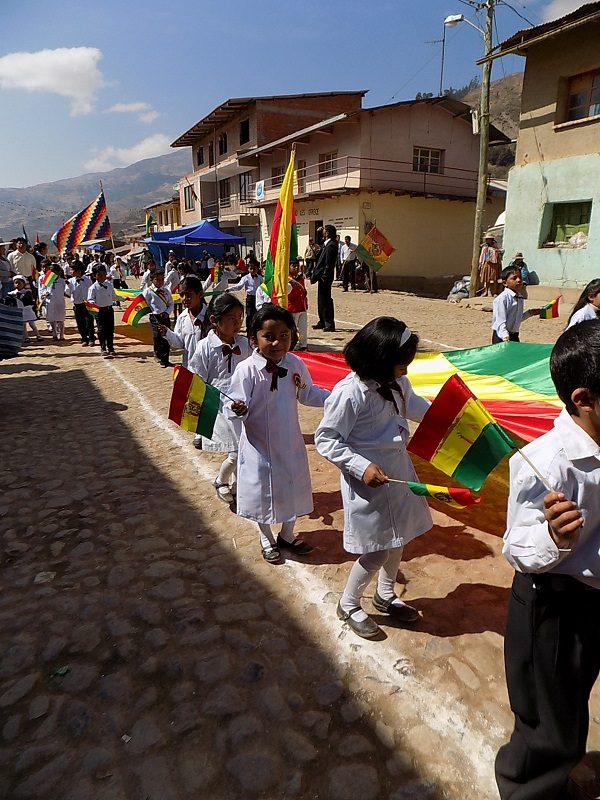 Without municipal government support PAZA couldn´t afford to visit rural communities and has worked only in Huancarani and Independencia since 2010. The local trainer did not attend Don Jorge´s workshops and her lack of interest resulted in Doña Máxima taking over as local trainer. 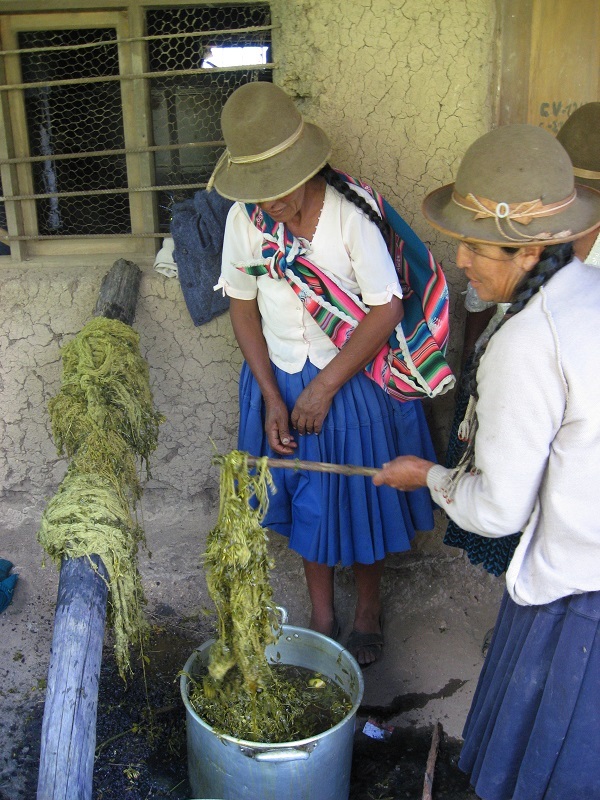 The macha macha berry introduced in the first workshop produces a fugitive dye and hasn´t been used since 2009. 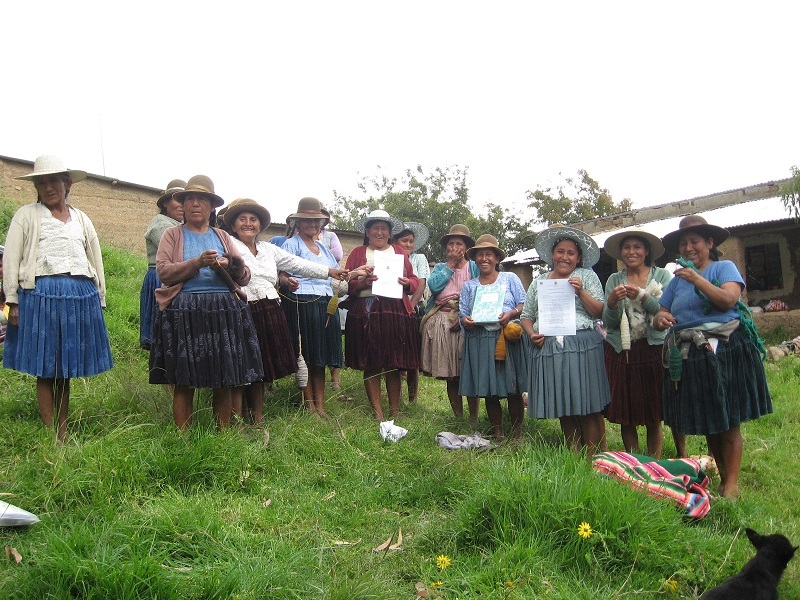 In 2011, KURMI´s development project was not renewed and their office closed. 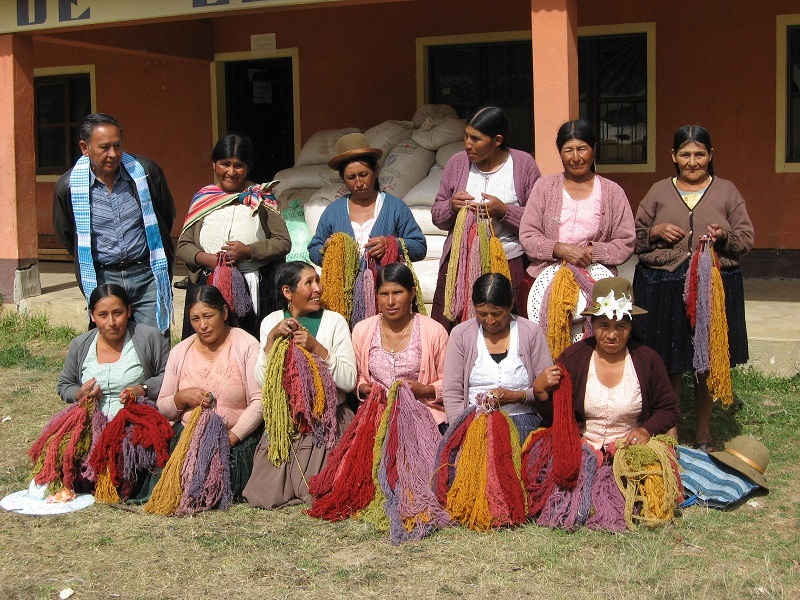 Through the years the Huancarani and Club de Artesana (CdA) weavers have learned to eyeball their dye pots to make the minute adjustments needed to arrive at the tones they seek for the color coordination of their weavings. 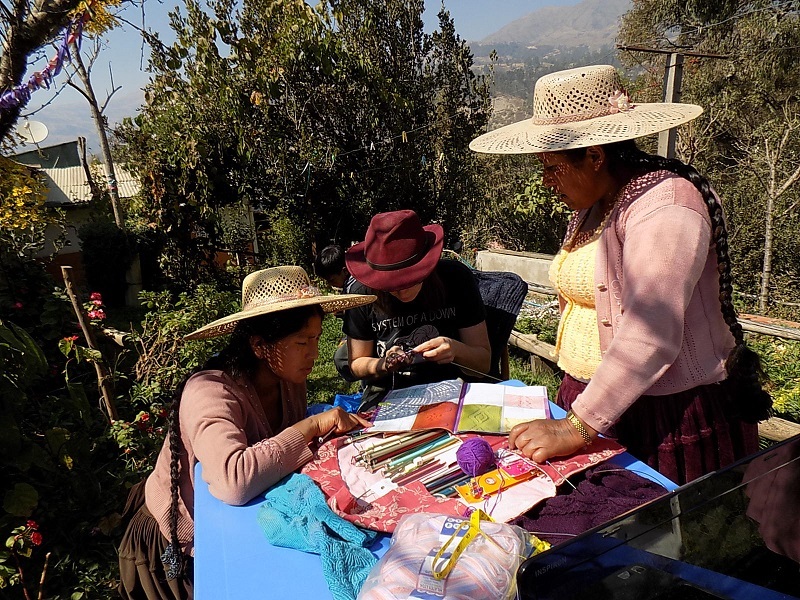 The first dye workshop had taken place towards the end of the rainy season when flowers, leaves and berries were at their peak, so it shouldn´t have been such a shock to realize that quick roadside gathering of dye plants wasn’t possible year around. 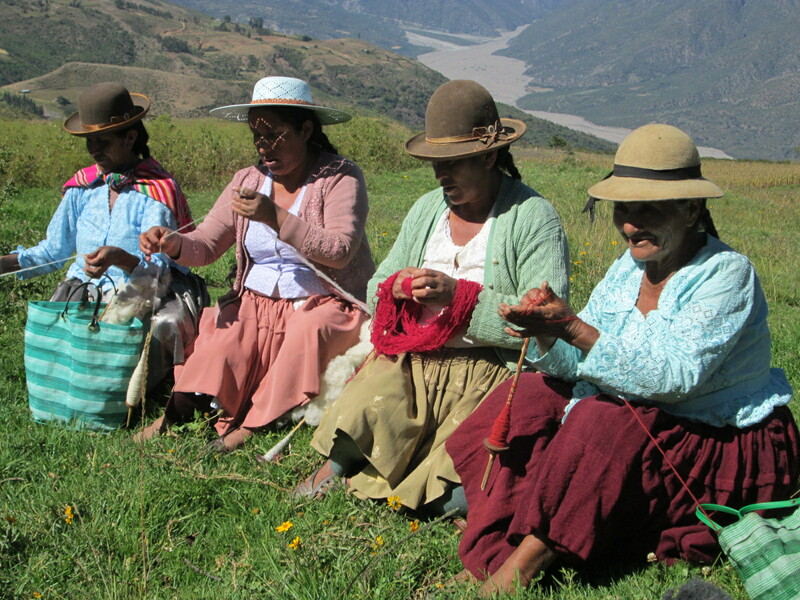 If called upon, many of the Huancarani weavers and all of the CdA women members could serve as natural dye trainers. 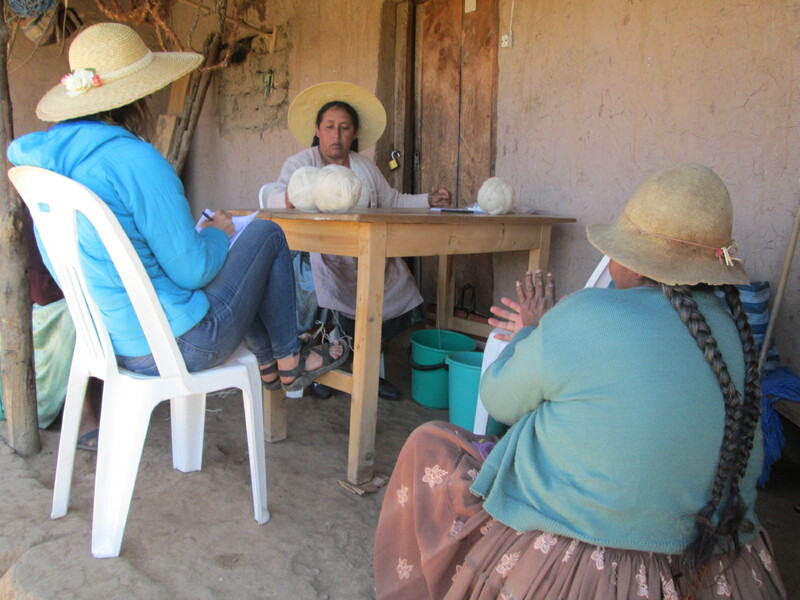 The PAZA curriculum for the 5 part progressive natural dye workshop program is waiting in the wings for when collaboration to rescue and preserve the textile heritage of Independencia is once again possible. 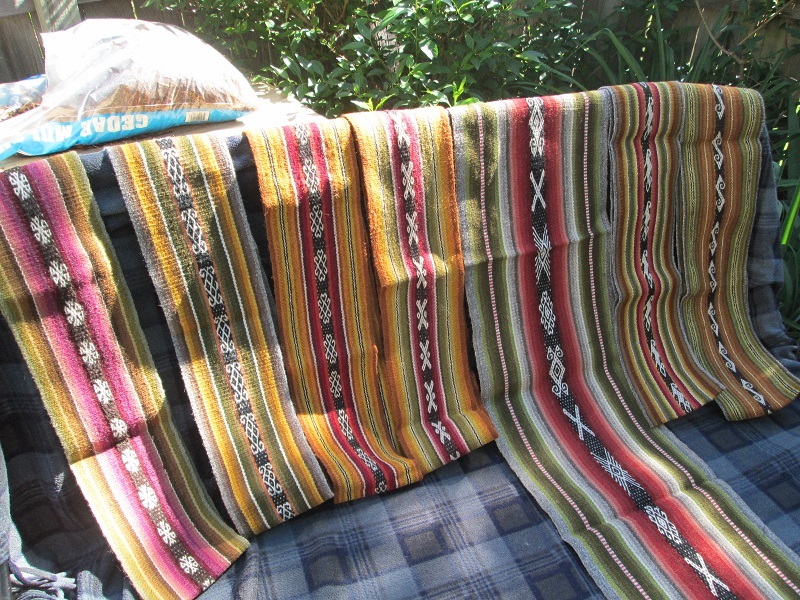 Thank you Laverne Waddington for your latest weaving order that is keeping Doña Máxima and the weavers in Independencia busy. A hug and thanks to Joyce Dutcher for her contribution to the Dutcher Family Fund that serves as the revolving fund to pay the weavers as soon as they complete an order. Thank you Dorothy Thursby and Nancy Meffe for your long-term support that allows all the PAZA activities to continue day in and day out. Hallelujah, it´s time to rev up for 2016 Spinzilla! Thank you Marilyn Murphy and Cloth Roads for sponsoring the Team Warmis Phuskadoras for their 3rd annual competition! 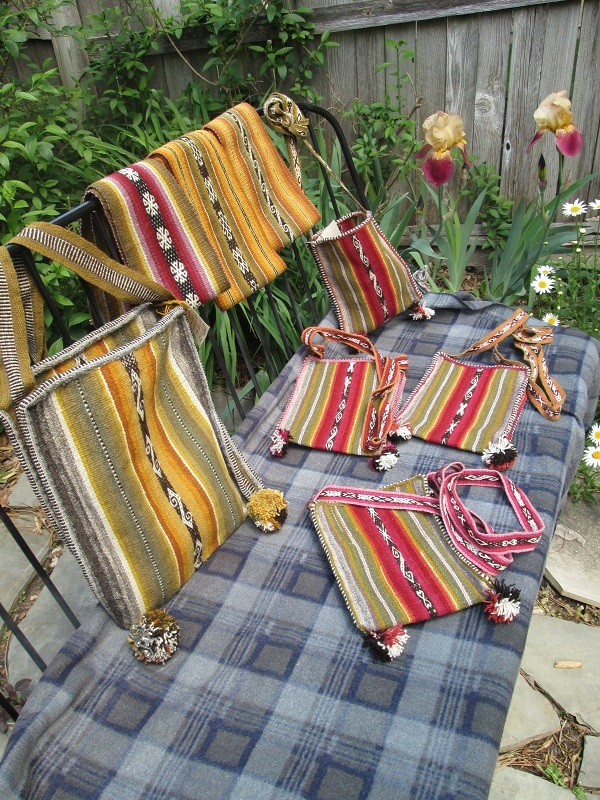 I look forward to seeing and/or meeting all of you who will be attending the WARP Conference and/or Santa Fe International Folk Art Mart. Dorinda Dutcher, June 27, 2016. 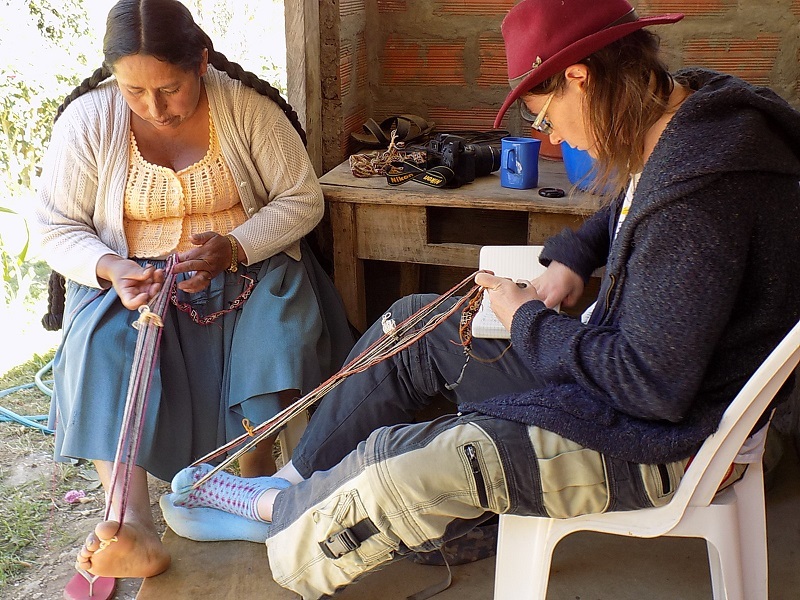 Susan Weltman, a weaver, who had listened to Dorinda´s tales at Weave a Real Peace (WARP) Conferences for the past 5 years, decided to check out Independencia for herself. 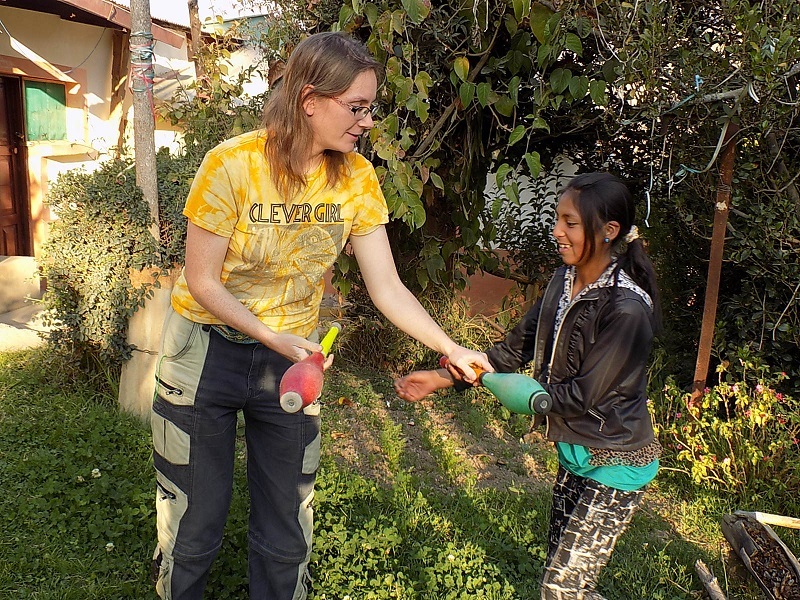 Her husband, Steve Jervis, thought Bolivia sounded like a grand adventure and in late February they were Independencia bound. 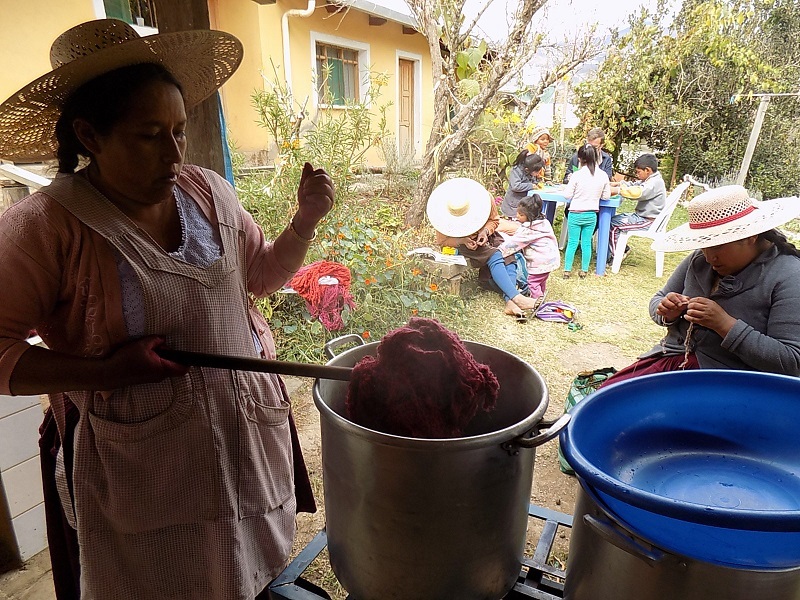 Although their stay was short, the Club de Artesanas (CdA) squeezed in 2 dye days. 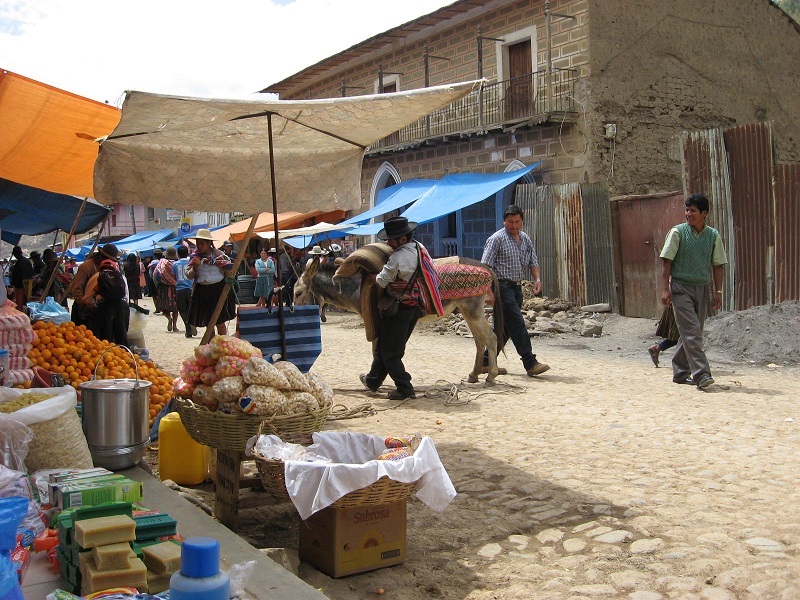 Susan and Steve treated Doña Máxima, Doña Antonia, and Dorinda to a “shopping” day in the campo. The other CdA members had kindergartners to pick-up mid-day so had to decline the excursion invitation. The persistent chill rain stopped the afternoon before the excursion giving the road time to dry out. The air was fragrantly herbal and sun bright on the morning all climbed aboard the chartered pickup truck. 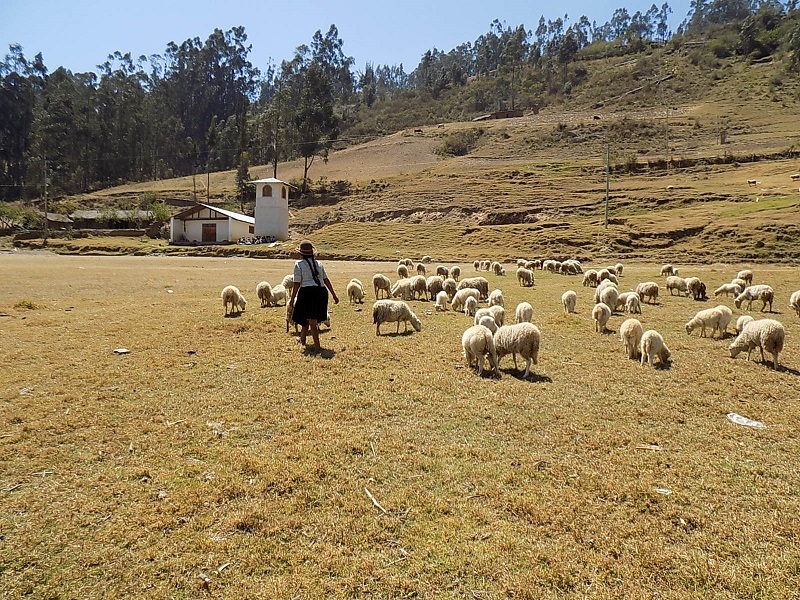 The +1 hour drive headed up the mountains to the farmstead of Don Franciso and Doña Gregoria, owners of a variety of fiber on the hoof – alpacas, llamas, and sheep. 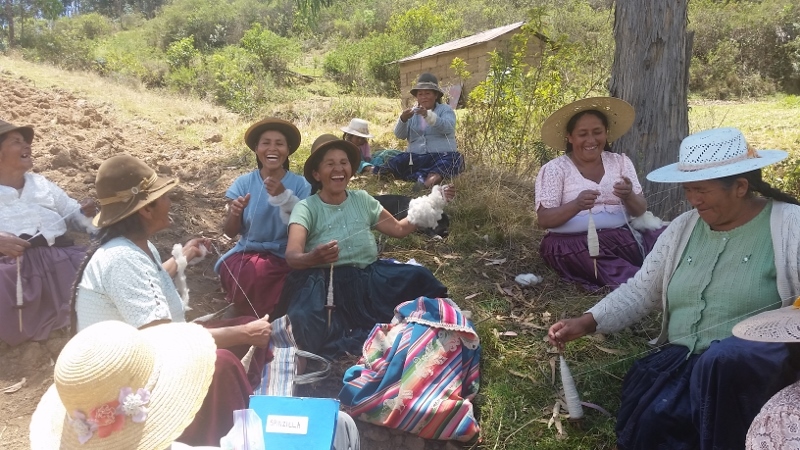 The last fiber shopping trip to their farm had been in 2014. 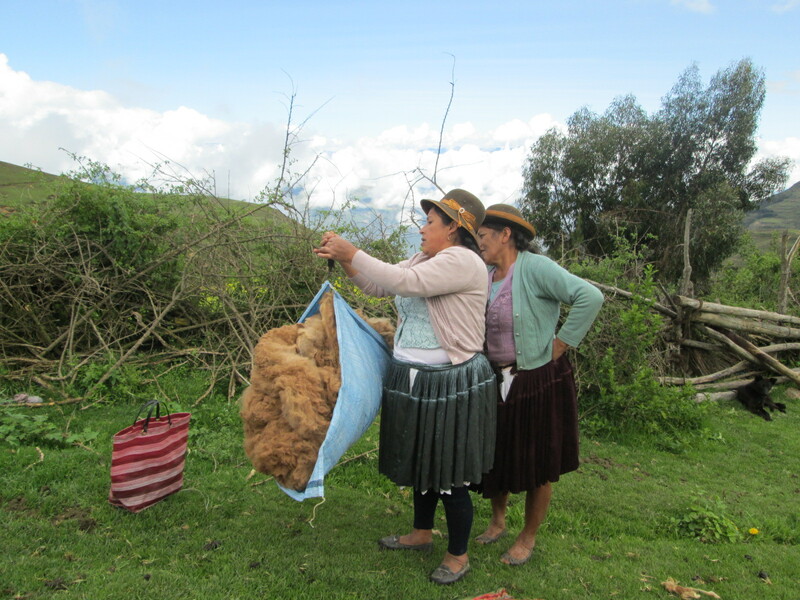 PAZA bought 3 kilos of tan alpaca fiber for $17.24. 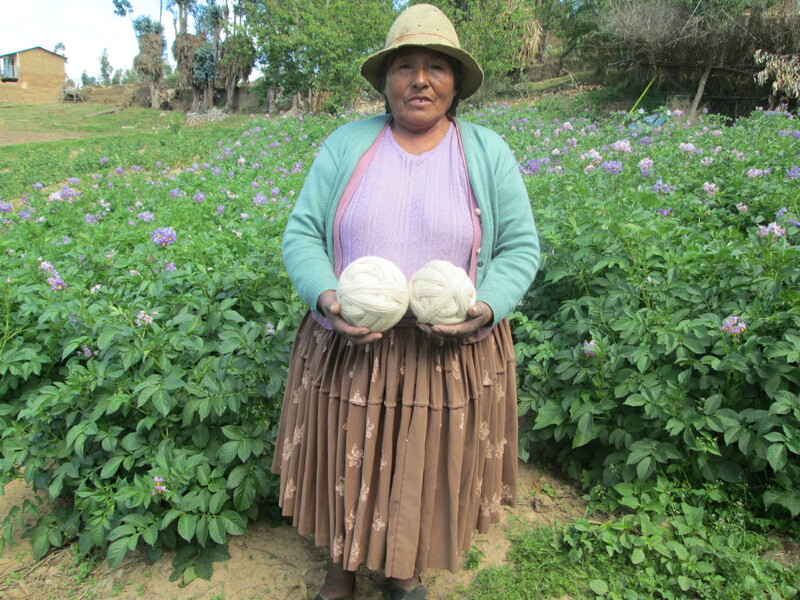 Doña Gregoria was firm on her price which hadn´t gone up since 2014, and she had no interest in raising it. One huge change since the last visit was the intrusive electricity towers that marched through the family´s farmstead. The towers first appeared on the horizon to the southeast of Independencia in October 2014. By April 2015 the cable was being strung along their path through the Palca River Valley where Independencia is situated. The sheer speed and efficiency with which the towers were erected was an amazing feat to witness. 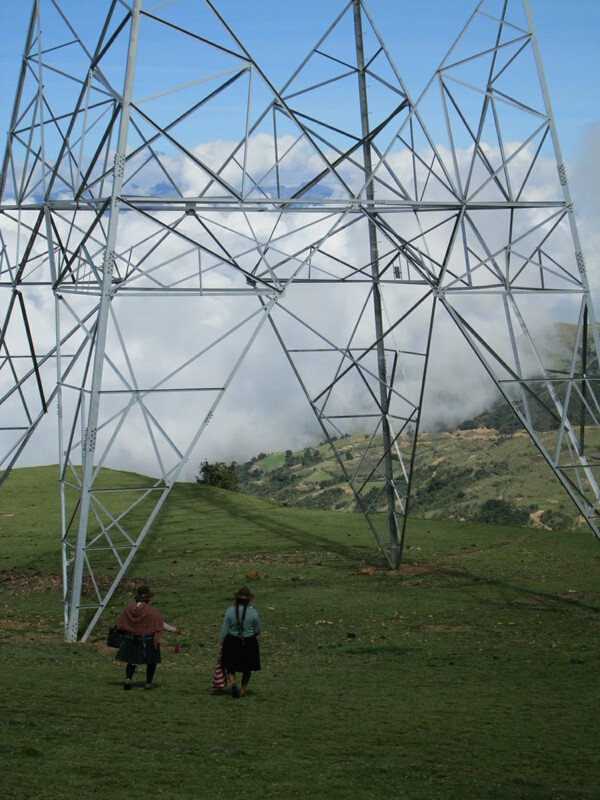 Alas, there is no tower-free vista and the electricity generated by a new hydroelectric dam is traveling the cables to be sold outside of Bolivia, bypassing communities and farmsteads such as that of Doña Gregoria´s that lack electricity…. 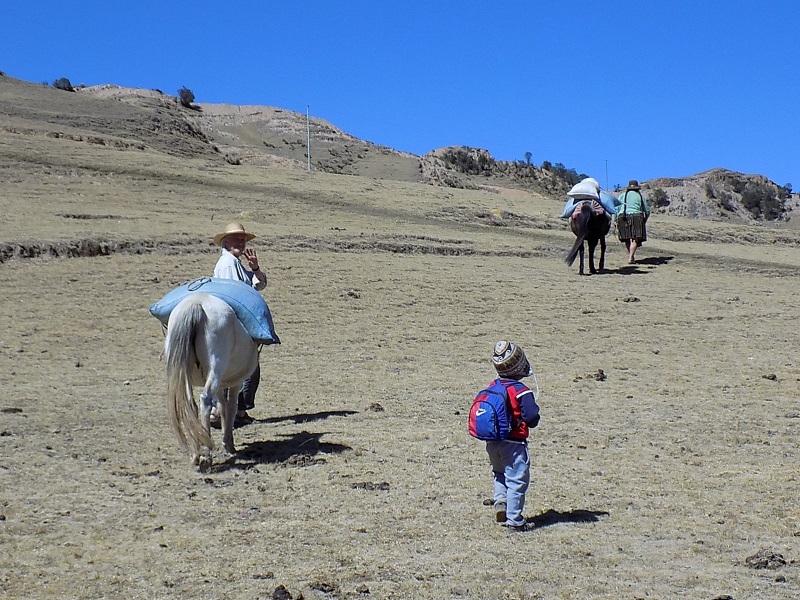 ambled leisurely up the mountain following the grazing llamas and alpacas. A short break was spent watching the babies frolic. 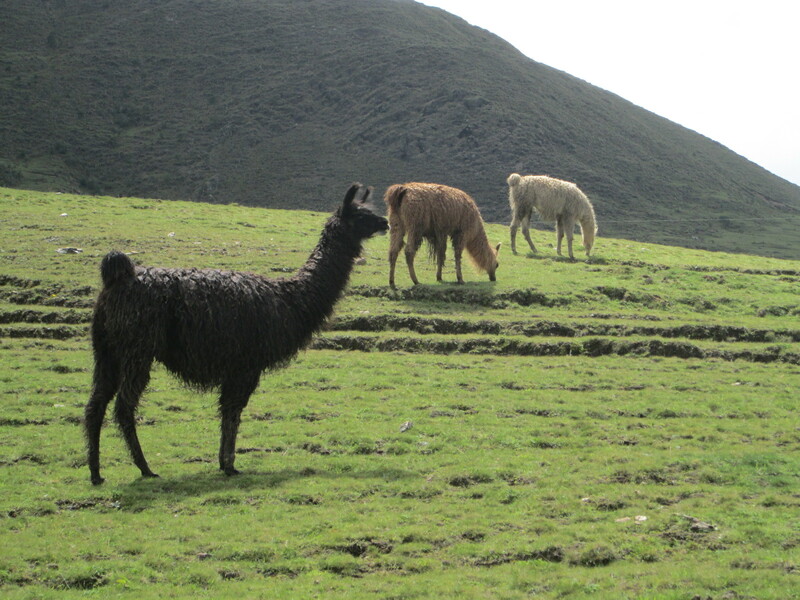 Doña Máxima identified her former llamas that she had sold to a llama broker for a pittance to help cover the costs of hosting Carnaval in Huancarani last month. 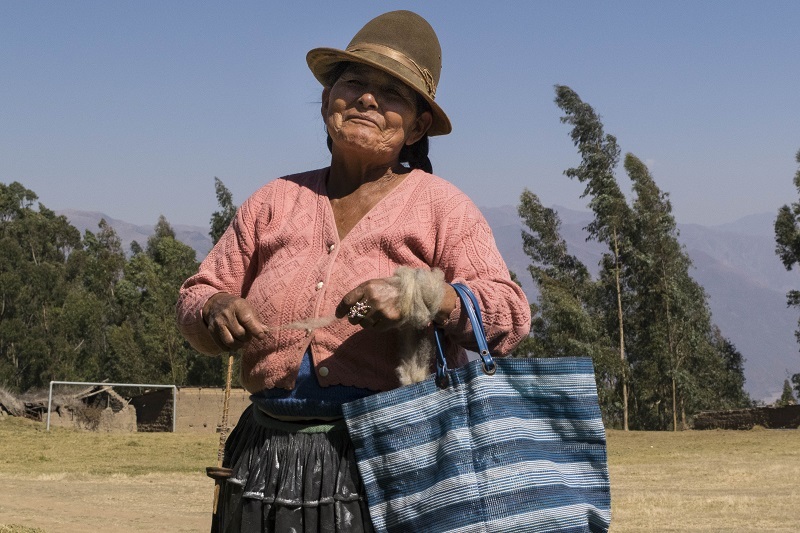 Culturally she has more faith in ownership of livestock than money in the bank, so it saddened her to know the llamas were no longer hers. 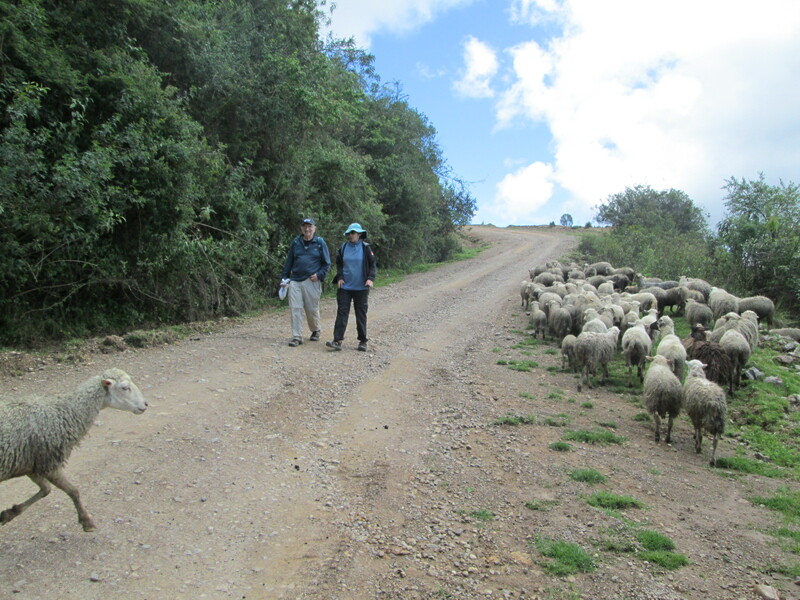 The group continued uphill to the top of the world where the truck awaited. 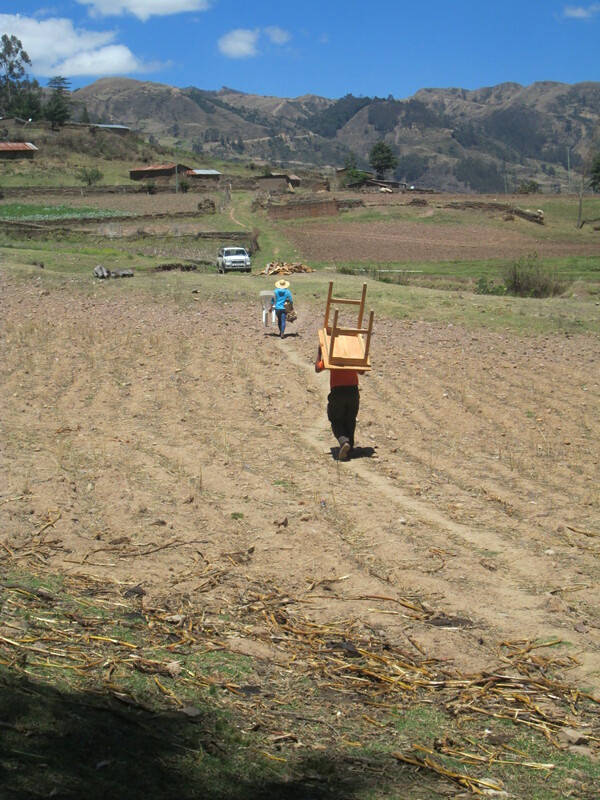 The next stop just past the crossroad to Huancarani was the potato patch belonging to Doña Antonia´s father. 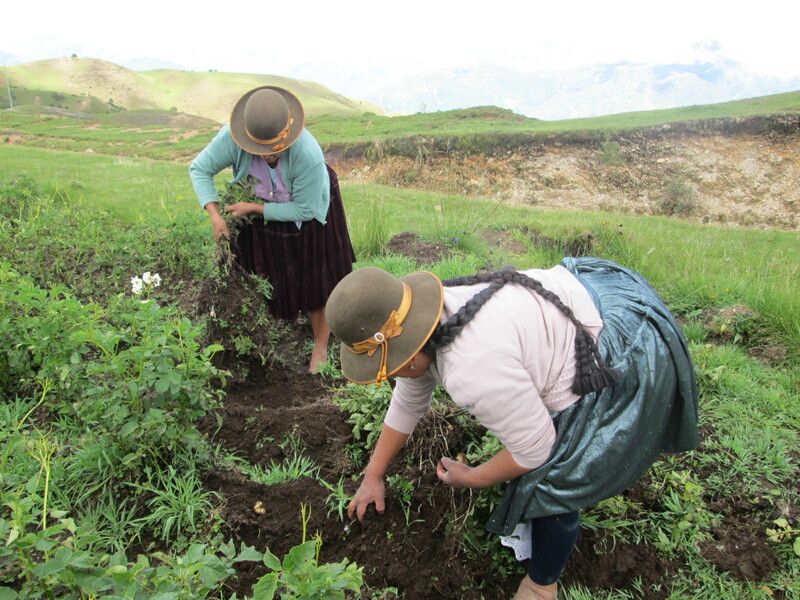 The ground was moist enough so that Doña Antonia and Doña Máxima could gently pull on the plants bringing the small white potatoes out of the rich black soil. Susan, Steve, and Dorinda walked along the side of the road picking the sunny yellow flowers, misiq´o (Bidens andicola) for the next day´s dye pot. All loaded back into the truck to move a little lower in altitude to where the misiq´o flowers and suyku (Tagetes graveotens Schultz) could both be harvested along the side of the road. 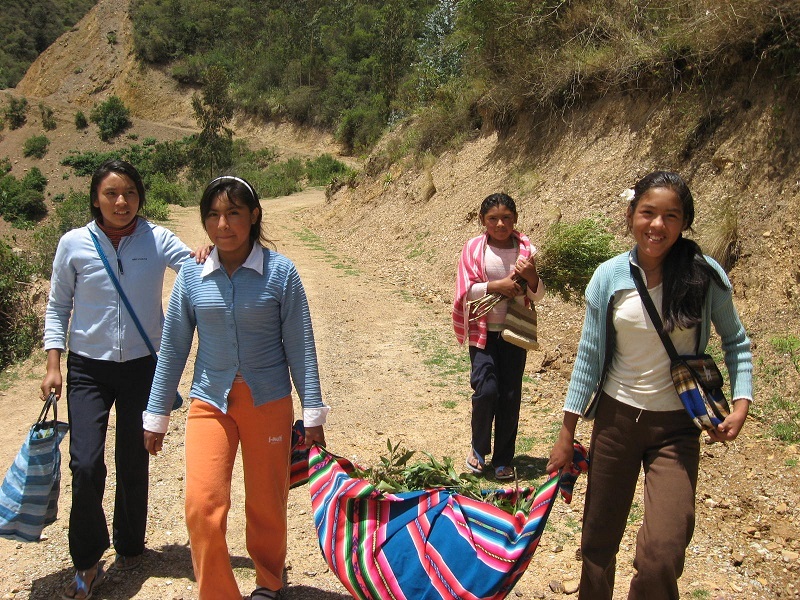 The truck headed down to a picnic spot, while the group walked downhill enjoying the views and harvesting dye plants. Susan’s comments of awe reminded the locals of their good fortune as to the abundance and variety of dye plants.